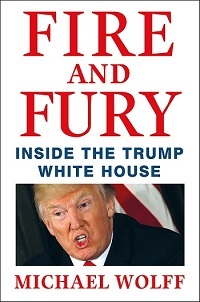 Fire and Fury: Inside the Trump White House confirms the worst characterizations of the US president and reports of chaos, with gory details supporting one senator’s observation that the White House had transformed into an adult day care center. Journalist Michael Wolff ridicules desperate attempts by White House staff and cabinet members to normalize an inexperienced, insecure president. Republican Party leaders, fearing their shrinking base, viciously turn on one another. Most alarming for the rest of the world is that a sizable number of Americans, about 30 percent of the electorate, expect that political bullying, manipulation, lying, with the ends justifying any means, might produce policies of benefit. The book warns that foreign policy is Donald Trump’s weak point: “If the Trump White House was as unsettling as any in American history, the president’s views of foreign policy and the world at large were among its most random, uninformed, and seemingly capricious aspects. His advisers didn’t know whether he was an isolationist or a militarist, or whether he could distinguish between the two. He was enamored with generals and determined that people with military command experience take the lead in foreign policy, but he hated to be told what to do.” For some leaders, Trump’s lack of experience opens the door to a “do-over” in relations with the United States. Much of the book is gossipy with coarse language because its subjects are this way. Few White House staff will appreciate the portrayal. Despite the campaign’s populist anti-globalist messages, many staff members are described as crassly ambitious, coveting the chance to join “the ranks of former government officials profiting off the ever growing globalist corporate-financial-government policy and business networks.” A few endure humiliation for a higher cause, not abandoning the country to even more fools, and Wolff suggests “this sense of duty and virtue involved a complicated calculation about your positive effect on the White House versus its negative effect on you.” Working at the White House centers on pleasing the president, and staff use tragedies like the April chemical weapons attack in Syria to make Trump seem more “presidential.” Professionals like Dina Powell, deputy national security advisor, openly worry about being linked to Trump’s brand or, worse, becoming part of “historical calamity.” For Trump, when others win, he is losing. Staff are on an unending quest via trial and error for unattainable balances of flattery and self-assurance, submission and sophistication, wealth or background of hard knocks that might convince him to listen and heed advice. The Trump team might have regarded Wolff as a savior had the author settled for recording the administration’s first 100 days as originally planned. From the book’s start, Wolff proffers a likely possibility that the Trump team, despite attracting a swarm of people with questionable Russia connections, was too naïve for deliberately colluding with the Russians to interfere in the 2016 presidential election. The family’s election goal was to magnify the Trump brand, not win. But win they did, and chaos and panic ensued. The book highlights former White House strategist Steve Bannon’s ongoing feud with the Trump’s daughter Ivanka and her husband, Jared Kushner. The couple, newcomers to Washington, were handed top advisor slots and a hefty portfolio including bringing peace to the Middle East. The couple sought out experts, but Wolff describes the amateurs as “less interested in bending to advice and more interested in shopping for the advice they wanted.” Ivanka and Jared long for respectability while Bannon’s goal is revolution. The two sides were irrevocably divided with the early rollout and failure of a travel ban for refugees and travelers from seven Muslim-majority nations. Other staff members, contending with the bitter factions, struggled to get policy drafts approved or decisions made. Trump appreciates praise, but the flattery works for only a short while. He is capricious, at times toying with staff, playing them off one another, and at other times frustrated and bored, demanding a single easy answer. He is irresolute and avoids accountability as in summer of 2017 when he tried to get Secretary of Defense James Mattis to make the decision on increasing troop strength in Afghanistan. Mattis forced Trump to make the call. More ominously, it "was sport for the president to defy [Chief of Staff John] Kelly." Few remain close to the president for long before other staff members, nervous about losing influence, target the latest favorite with criticism and subversive leaks. Wolff relies most heavily on comments from Bannon who claims to have staunchly opposed firing FBI Director James Comey. Bannon also described a June meeting with Russians organized by Donald Trump Jr. as “treasonous,” but since Fire and Fury’s publication, Republican donors are said to be abandoning Bannon and he has revised the characterization. Bannon tried to put up a firewall to stop the president from talking about the investigation, but in a fateful July interview with the New York Times, Trump suggested that Robert Mueller, the special counsel investigating Russian influence over the US election, would cross a red line and violate his authority by examining the family’s finances. Bannon was outraged, pointing out that such advice put the investigators on a trail for money laundering. Bannon’s firing the following month likely ended Wolff’s access. Bannon’s departure could impact Trump’s China policy. “To Bannon, if not to Trump, the linchpin of Trumpism was China,” Wolff explains. “The story of the next generation, he believed, had been written, and it was about war with China. Commercial war, trade war, cultural war, diplomatic war – it would be an all-encompassing war that few in the United States now understood needed to be fought, and that almost nobody was prepared to fight.” Meanwhile, reports suggest that the Securities and Exchange Commission and a US attorney general are investigating Kushner Cos. for its use of a federal investment-for-visa program. Wolff suggests that Trump is fundamentally an appeaser who does not want to cross the Russians, Chinese or other adversaries. Politics during the first year of the Trump administration employed the art of conflict, not compromise, for both domestic and international affairs. Foreign leaders and diplomats should heed this book as a warning: Expect little in the way of reliability, mutual loyalty or confidentiality from this White House. Former British Prime Minister Tony Blair met with Kushner in February and, as recounted by Wolff, offered a rumor that the British may have had Trump campaign staff under surveillance. Blair denies the claim, and the CIA advised Kushner the information was incorrect. Rich with intrigue and irony, the book will disappoint meticulous readers who want to discern which anecdotes were witnessed by Wolff and which came secondhand. He also admits that some tales have multiple versions. Still, the reporting rings with truth, confirming patterns of behavior on full display since Trump hit the campaign trial. ““It took absolute discipline not to acknowledge what everyone could see,” notes Wolff. The political gossip is entertaining, a fast read, until we remind ourselves of the subject matter and the consequences. Fire and Fury does not diminish the presidency. The occupants of the White House did this on their own with damage to their own reputations – “We look like buffoons,” was Bannon’s assessment. Meanwhile, people around the world openly question the judgment of the Trump administration’s staff and the American people. Normally, most would not fear a small group of inept bumblers, but these are not normal times as Congress fails to perform its oversight duty. Instead, there is everything to fear. A very balanced review of a very controversial book. "The political gossip is entertaining, a fast read, until we remind ourselves of the subject matter and the consequences," sums my own sentiment well.